Been busy this week playin with paper clay. So far I have pumpkins, giant eggs and jars. the two painted pumpkins were my fist attempt a while back and I like that I can air dry them instead of baking them. Had some sad news too. the local mini shop that has been open for 25 years is closing its doors. So off I went of course and I got all kinds of goodies. 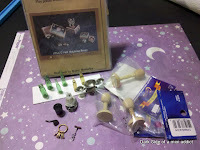 Some will be used for Christmas projects and some will probably be used in the building at the mini class I am going to take. The total haul included: wood strips like base boards and chair rail, glass jars, laser cut fall leaves, canister, tobacco pipe, wood boxes, hat stands, keys, and a resin chair. Ack...the chair hmm now where did it go... Have a great weekend everyone, thanks for following me on my mini adventures! Gonna take a mini class for my cake day! Yepp, I'm all signed up and my seat has been reserved. I'm going to take my first mini workshop in a few weeks it's a fantasy house with a fireplace. Where we will learn a inexpensive way to create stone, brick and stucco. My mom is taking the class too so hopefully I will be able to take a few pics as we build. I like the kit, it's a little wonky but has much appeal. 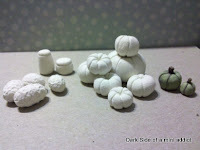 I'm already making vines to attach to the side of the kit, and today I made some paper clay pumpkins too. I'm thinking of a little old cottage, but we shall see once I get started. But really it should have pumpkins, little known fact about myself I LOVE pumpkins! I eat-em, bake-em, grow-em, make-m, I typically have a few real ones just hanging around the house. 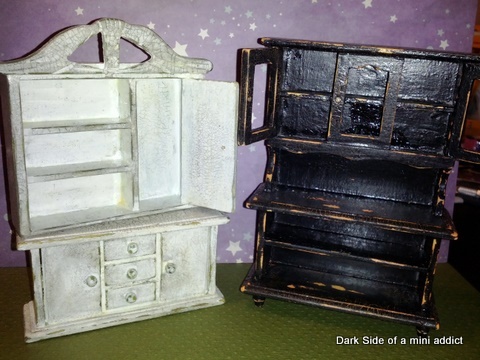 They are also in most of the mini scenes I create. For me pumpkins go hand in hand with Halloween, like snow globes and Christmas. That's it for now, I'm off to do another load of laundry. I had a few of those hutches laying and thought I'd work on them. One of them will be for my mom. She has a kit that is going to be a yarn shop. So I think the lighter one will work and have enough room for skeins of yarn. 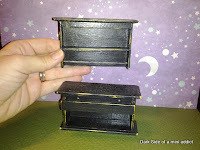 The first time I separated the top and bottom of the hutch I actually sawed them apart. The next one I did I stuck it in the microwave at 15-20 second intervals untils it warmed the glue enough and allowed for a much easier separation. I think I will stick to that method.